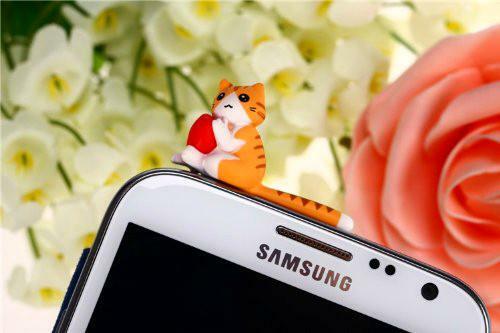 Kitty cat iPhone dust plug that inserts into the headphone port of your smartphone and keeps it free of dust. Truth be told the anti-dust function is not that important but they sure do look cute and such. It comes in four colors: black, dark grey, light grey and orange. 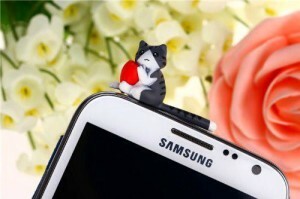 Keeps headphone jack free of dust and dirt. Fits into any 3.5mm headphone jack, which is the standard sized used by Samsung Galaxy, iPhone and HTC phones. The design of the cats are great and it is nice that they are striped tabby cats as well. The design of the cat overall is very good with quite a lot of detail. For the price it is a very nice little item that is a bit of a steal.